The term Laogh aptly describes Patsy and his exploits in the sporting fields of Tipperary and further afield oftentimes had the hillsides ablaze around Glengoole to celebrate after another of his famous victories. Patsy was born to be a winner , as his late father was an All Ireland senior hurling medal winner in 1908 with Tom Semple’s famous Thurles Blues. While Patsy was no mean hurler himself, he never attained the status if his father. He played at midfield in 1956, when Glengoole captured their first Divisional Junior title in defeating Clonmore/Killea by a one point margin and it was a crucial goal by man of the match Fitzgerald that led to the victory. At a time when there was a very close allegiance between the GAA and athletics he really made his name. In 1946 the young Fitzgerald took the scene by storm, when, as a wiry 17 year-old, he captured his first senior All Ireland cross-country championship in Mount Merion, Dublin, passing the winning post 200 yards ahead of the next competitor. By 1952 he had achieved a record that may never be equalled when he won his fifth senior title in a row. His athletic prowess took him all over the world and he never failed to do himself justice. In 1954 he crowned a glorious carer in athletics, at club, county, All Ireland and International level when he captured the 10 mile championship of Ireland , breaking the record for the distance. Patsy Fitzgerald from Poynstown, Glengoole is remembered as one of the best athletes that Tipperary and Ireland ever produced. He came into the sport of athletics by complete chance when as a teenager on a Sunday afternoon, with nothing better to do, he went to see athletes training for a race in the locality and from what he saw decided he could run as fast as any of them. That was over sixty years ago and he decided to get involved in the hope of being involved in an upcoming a trip to Dublin for a race. The following Sunday he entered for the Tipperary novice cross country championship and literally ran away with the race to blaze a trail of a most illuminating career in Irish athletics, victories as astonishing as they were almost incredible. He was then selected on the Tipperary team for the All Ireland junior Cross Country championship at Ballinasloe, Co. Galway in 1946 and from an entry of 13 teams, he spread-eagled the big field to win comfortably and lead Tipperary to victory. The All Ireland senior championship, over the then standard distance of nine miles, was fixed for Mount Merrion Dublin and the Tipperary mentors decided that Patsy was too young to compete that gruelling test. He travelled to the race as a spectator, When his neighbour and team member Tom Fitzgerald was unable to start, due to injury , it was decided, on the intervention of Tom Healy, Coolcroo ,(Team manager) that Patsy would take his place. One Tipperary official said it was madness to run young Fitzgerald, as he was running against all senior experienced athletes including John Joe Barry, the famous "Ballincurry Hare". Midway through the race he was running alongside team mate, Patsy Carroll, and asked the more experienced athlete would they be going any quicker. Carroll replied 'I can’t anyhow, and they won’t go any quicker; can you' ? Patsy replied “I can run faster” and he took off and gradually reeled in the field to achieve an historic win by 200 yards, a great feat for a teenager. Imagine his father's surprise that night when he tuned into Radio Eireann to hear the race result and see how neighbour Tom Fitzgerald fared. However, the announcer regaled the merits of the young Patsy and his dad found it difficult to believe! A long abiding memory Patsy has of that race was when the athletes came back to tog in in nearby public house, Tom Healy (team manager and Irish mile champion in 1941) had a number of pints of ‘Guinness’ waiting to quench their thirst. Although a non-drinker, Patsy could see Tom's appreciation of their efforts. During his career Patsy Fitzgerald won 34 All Ireland gold medals individual and team He won several Co Tipperary championship medals on track and cross country, AAU & NACA(I). He won seven All Ireland Senior Cross Counrty titles including five in a row, On the track he did not race very much . However when he did he was also successful winning Irish titles over 3 miles and 10 miles beating the best track athletes of that period in the process. He represented Ireland in International cross-country competitions on six occasions. He was a member of teams that consisted of such great Irish runners as his club mates Jerry Kiely, Paddy Fahey, Jimmy Sweeney, Tom Fitzgerald, John Caesar, Larry Donnelly; Steve McCooke, (East Antrim), John Joe Barry (Tipperary), Kevin Maguire (Donore Hrs), Michael O'Connell (Clonliffe & Clare), Charlie Owens and John Diamond (Co. Mayo. INTERNATIONAL CROSS COUNTRY APPEARANCES WITH IRELAND. 1947: At Hippodrome de St.Cloud, Paris on Sunday 30th March: 14.5 km. 1948: At Leighton Park, Reading on Saturday 3rd April: 14.5 km. 1949: Baldoyle Racecourse, Dublin on Saturday 26th March. 14.5 km. 1950: Hippodrome de Boitsfort, Belgium on Saturday, March 25th. 14.5 km. 1951: Caerleon Racecourse, Newport, Wales on Saturday March 31st. 14.9 km. 1952: Hamilton Park, Glasgow on Saturday 22nd, March. 14.5 km. When his AAU days came to an end Patsy Fitzgerald returned to the NACA and joined the Ballincurry club winning county and All Ireland Senior cross country titles. Speaking on training methods during the 1940's Patsy Fitzgerald remembers the hard work of the period with farmers up early milking cows, working all day in the gardens, ploughing and tilling with horses and the other farm chores before mechanisation.. It was the age of compulsory tillage in Ireland. Their training mainly consisted of a race or run on a Sunday and plenty of road walking in the dark at night. When asked by other athletes what type of training he was doing they did not believe him and thought he was having them on. Gym or track work did not figure in their schedules as it was not part of the culture of the time and in any case there were none around. Patsy Fitzgerald was one of the "natural" athletes of his era and his training methods to-day would be considered inadequate and unorthodox but for the Tipperary man the system proved effective. After his initial cross country experiences he learned how to pace himself during a race and not to allow too big a gap to open. His devastating finishing burst always proved decisive. He was noted for how fresh he was after a race with the typical comment being “there was not a puff out of him” To the possible annoyance of the other athletes he was continuously talking during his races when others were gasping for air. Patsy remembers, with fondness, his association with the Healy family of Coolcroo, and the influence they had on his running career. Also he has fond memories of the famous Billy Morton of Clonliffe Harriers and the inspiration behind the construction of Morton Stadium in Dublin. Amongst Patsy’s memorabilia is a lifetime free pass into the Stadium. In 1947 when competing in the in the youths (Under 18) one mile championship of Ireland he felt a little bit embarrassed having won the Senior Cross Country earlier in the year. He was toying with the opposition until Billy Morton shouted at him “get on with the race “He stormed onto the lead and won easily. It was also Billy Morton who tried to persuade him to take up the offer from Villanova University early in his career. Speaking to Patsy about his career was an absolute pleasure. His recall of the events of the time, including the people he came in contact with is still crystal clear and the pleasure he got from the whole athletic experience still shines through. He is quite happy with his achievements and had no regrets. However I got the impression that he wonders what he could have achieved had he really put his mind to it and made an effort to achieve the Olympic qualifying time or accepted the opportunity to go to the US. He saw athletics as fun and something ‘kind of local to be enjoyed’ which he certainly did. After his athletic career he got involved in flying, being the holder of a pilots licence He also spent some time training greyhounds. His flying career, which was purely a hobby, was with the Central Flying Group, Thurles. On the day of the official launch of the club Minister Charlie Haughey was on hand to do the honours. The whole thing went fine including a lunch in Hayes Hotel with the Minister. The only thing missing was an aeroplane. Below are some of the press cutting. The man referred to is P. Fitzgerald, who hails from the same county Tipperary as J Barry. He ran away with the Tipperary Novice and Junior Championships recently and according to Mr J. Conaghan, (Hon Sec. of the NACA) is reckoned to be very little behind the famous Barry down Tipperary way . Tipperary are confident of retaining the championship, but they will have their work cut out to do so, for Galway, who will have the advantage of being on home ground. Clare, Dublin, Meath and Sligo are all strong challengers, while Limerick, who reappear after a lapse of some years, are also hopeful of success . The race it timed to start at 3.45pm. No 1:- Monaghan. J. Curley, J. Gormley, M. Fitzsimons, P. Pritchard, A.Reid, M McNally J. Todd, H McKenna. L. Todd, P. McKernan, M. McKenna, M Curley. No 4 Sligo. V Harte, T. Ross, R Kivlehan, R Milne, F Kivlehan, J McCarrick, W Donohoe, E Ross. P Higgins, J O’Rourke, T Brennen T Martin, Sub A Byrne. No 6 Galway No 2 A Moylan. L Goode. P Goode, P Glynn, F Stephenson., J Menton, P Bergin T Ryan, J Burke, P Keane. H Keady B Kely Subs, M Keady, J Mahon, E Miley. TIPPERARY won the All-Ireland Junior Cross-Country for the second year in succession at Bal­linasloe yesterday, and once again they had the first man home, P Fitzgerald emulating Barry's per­formance of last season, winning by 300 yards from J. Diamond, of Mayo, in 21 mins. 59 secs. Corcoran, of Dublin. was the leader in the to the first lap and Diamond made the running on the second, when Tipperary had installed themselves as favourites for honours, having five men up in the first twelve places this stage. 2 Galway 4, 12, 13, 16, 17, 21. 83pts. 3 Dublin. 10, 19, 27, 32, 33, 35 156pts. Running barefoot, over a nine miles snow-covered course, Coolcroo Athletic Club had a runaway victory in the A.A.U. Senior Cross-Country Championship at Finglas, Dublin, on Saturday. Their total of 30 points would have beaten a team composed of all the other, clubs in the race. Supplying the winner in the person of Patsy Fitzgerald, and finishing seven men in the first twelve, Coolcroo completed a notable double, having won the Six Counties A.A.A. Junior Championship at Bel­fast a fortnight previously. L. Donnelly (Coolcroo), K. Maguire (the ex-Army runner, now of Donore Harriers), P. Haughey, also of Donore, and John Caesar (Coolcroo) ran abreast throughout the major portion of the race, Patsy Fitzgerald being content to remain behind. But he forged ahead with Maguire, entering the last lap, and going up the "straight" they were neck and neck. It was only in the last forty or fifty yards that Fitzgerald got his chest in front to, win a great race. Fitzgerald ran well within himself throughout the race He finished very fresh in sharp contract to Maguire Though Maguire was only two seconds behind he was well spent and collapsed after crossing the line. On Saturday, March 9th, Fitz­prald will meet S. McCooke, the Northern Ireland crack, in the Senior Championship of the A.A.U. and the N.I.A A.A. in Dublin and the meeting of the pair should prove attractive. 2—K. Maguire, Donore-54 mins. 5 secs. 3—L. Donnelly, Coolcroo-54 min 6 sees. 5—T. Fitzgerald, Cooloroo, 54 mins. 31 secs. 6—J. Caesar, Coolcroo-54 mins. 33 secs. 8—L. Fanning, Coolcroo-56 mins. 10 secs. 10—W. B. Powell, Dublin University-56 mins.30secs. 11—J. Crossan, Civil Service-56 mins 46 secs. 12--D. Kennedy, Coolcroo-56 mins. 46 secs. I—Coolcroo (1, 3, 5, 6, 7, 8)-30 points. His success, which was his second in the championship, the other being scored in 1946 at Mount Merrion, was most decisive , and once he shook off his county man, Sean Hayden, going into the final, two and a quarter mile, lap he was never in danger of being beaten. The Premier County, with their scoring six home in the first fourteen for a total of forty-eight points had twenty five points to spare over their great and gallant rivals Galway with the All-Ireland junior champions, Limerick in third place. Next time round Fitzgerald and Hayden were running side by side with Killeen and the Limerick man, Tommy Walsh, in fourth position. The title holder Morris was in fifth position. The time at the halfway mark was 21 minutes 31 seconds. At the bell Fitzgerald pulled slightly ahead of Hayden with Andy Monaghan, second two years ago, now in third position and the Limerick runner Tom Walsh fourth. Morris was fifth, Killeen sixth and another Dublin man Sean Fitzell seventh and those positions were maintained until the tape was reached. A correspondent under the pen-name 'Galteemore" writing in the Clonmel Nationalist on April 13 th. 1946 acclaimed the achievement of winning the All Ireland thus ' Magnificent Tipperary; These famous words came to our mind on seeing the blue clad boys of Tiobraid Arann sweep forward to victory in the senior All Ireland cross-country championship at Mount Merrion, Dublin. They had seven men in the first eight to finish the gruelling course, since the race the bold facts of the race have been told and re-told throughout the country. There were exciting scenes at the finish as the Tipperary contingent was exuberant with joy at this gallant and superb display by our boys. What excitement as that gallant little thoroughbred gorsoon, Patsy Fitzgerald of Glengoole raced home to any easy victory for the individual title - a title that acclaimed him to be the best cross-country runner in Ireland at the early age of seventeen years and a bit. Who could believe it - yet such was the case. Down the finishing straight he tore, between lines of excited spectators, some of them wildly gastrulating as they saw the youthful Tipperary boy leave all opposition behind and win by nearly 200 yards at the speed of a sprint finalist. I spoke to him afterwards and he was the least excited 'man' on the field - not a puff out of him - he did not turn a hair as a result of his great effort. Here we thought was a champion already but a champion of champions in the making. Was it any wonder that our hearts went out to the magnificent incomparable boy, from the plains of Tipperary; who could win and did win in fine or foul weather conditions as proved decisively at Ballinasloe in a snowstorm and in Dublin in a broiling sun. Who says Knocknagow is gone He then decided to change his allegiance from the NACA(I) to the AAU and joined the recently affiliated Coolcroo club. 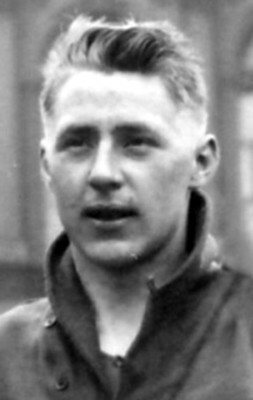 Patsy and the club made their debut in the AAU All Ireland in a snow covered course Belfast in 1947 for the All Ireland junior. Patsy surprised the star-studded assembled field including Kevin Maguire who had previously beaten John Joe Barry, Fitzgerald won in a canter, and Coolcroo won team prize . C00LCROO A.C., winners of the Junior Championship at Bel­fast a fortnight ago, ran away with the A.A.U. Senior Cross-Country Championship at Finglas, Dublin, on Saturday. The Co. Tipperary Club supplied the individual winner in P. Fitz­gerald, who won the Junior Championship at Belfast a fortnight ago and who last year put the junior and senior races of the NACA to his credit, and their scoring team of six finished within the first eight places. Were it not .that Maguire and Haughey (the ex-Army men,) who. last year were first and second respectively when running under the colours of the Bro,wnstown (Co. Kildare) Club, finished amongst the Coolcroo team, the latter might have scored the minimum number of points. As it was, their total of 30 points would have beaten a team composed of all the other clubs in the race. Although the snow did not fall dur­ing the race, the ground was well covered, and the nine miles proved a very severe test. 2. K. Maguire (Donore), 54 mins. 5 Sees. 3 Donnelly (Coolcroo), 54 mins. 6 secs. 4 P. Haughey (Donore), 54 mins 12 sees. 5 T. Fitzgerald (Coolcroo), 54 mins. 31 sees. 6 J. Caesar (Coolcroo), 54 mins. 38 secs. 8 J. Fanning (Coolcroo), 56 mins. 10 secs. 10 W. B. Powell (Dublin Univer­sity), 56 mins. 30 secs. 12 D. Kennedy (Coolcroo), 56mins. 46 secs. 2 Donore-2, 4, 9, 17, 19, 22 73 points. P Fitzgerald (Gortnahoe) a 17year old youth won the Co. Tipperary junior cross-country title. at Coolquill from a field of 100. He had won the novice title three weeks pre­viously. M. Kelly (Coolquill) was second, and M. Clery (Moneygall). third. It was 1946 in Gortnahoe that he ran his first cross country race — the county novice. He duly won it and followed that with a win in the junior — a fine perfor­mance but nothing extraordinary. Next, he traveled to Galway for the national junior event and won that. There was now a slight pause, for it was time for the county senior and he was deemed too young to compete. Then we had the highlight of the year, the national senior in Dublin. He decided to travel with the team as a spectator. Before the race, it was discovered that a namesake of his had not turned out so he borrowed a shorts and ran and won. He was then the ripe old age of 17. It was a truly extraordinary accomplishment. The following year, he joined the Healys of Coolcroo who were then competing with the A.A.U. He won the All-Ireland junior in Belfast and the A.A.U. senior in Dublin. Over the next few years, he collected two more senior titles. In 1947, he competed in the international cross country in Paris. He was to follow that up with at least four more inter­nationals. His best placing was 23rd in England in 1948. On the track, he also had a number of successes winning Irish 3 miles and 10 mile titles. At an early stage, he was also offered a scholarship to the famous Villanova University. In 1954, he returned to the N.A.C.A. and won the county and Irish senior championships. Sadly, this was to be the beginning of the end of an illustrious but all too short athletics career of the great Patsy Fitzgerald whom we honour here tonight as the Tipperary Athlete of the Past for 1983. At the recent Tipperary Co. Board BLE/BLOE: dinner, Patsy Fitzgerald was honoured as the "Tipperary Athlete of the Past." The national president of BLE, Rev. Fr. O'Donnell. travelled all the way from Belfast to make the presentation on behalf of the County board. To mark the occasion, Father O'Donnell also made a presentation to Patsy on behalf of the club. Patsy’s list of achievements was so outstanding that they were almost incredible. At the age of 17 he won the All-Ireland youths, novice and senior cross-country titles all in the one year. For the next ten years he won the All-Ireland cross-country title on a regular basis as well as many track titles. He also represented Ireland in many inter­nationals in Ireland. Britain and Europe. To Patsy Fitzgerald and his wife Eileen for their co operation and for making memorabilia available.